The influenza virus, like all viruses cannot be cured. However, the symptomatic effects of the virus infection can be alleviated temporarily with medication or natural home remedies. Many people are misled into thinking that taking flu medication when infected will speed up their recovery, but medication only makes flu symptoms tolerable while influenza runs its course. It is a healthy alternative to use natural home remedies instead of over the counter medications with high alcohol content and unfavorable side effects. 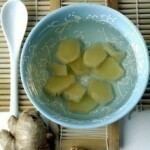 Aromatic Steam; add two teaspoons chopped fresh ginger to a container filled with steaming water. Cover your head with a towel and lean over the steam; inhale for as long as you can then pause for air. Do this until relief is achieved. Alternatively, a few drops of eucalyptus oil can be used. Warm Shower; close the bathroom door and take a warm shower. The steamy bathroom will help to open airways and moisten and thin sinus mucus. Hydration; increase liquid intake. Keep your hydrated with water and drinks high in vitamins and antioxidants. Water will keep the respiratory system hydrated and contribute to the liquifying thick mucus that build up and cause respiratory infection. Liquids like coffee, alcohol and tea will cause dehydration. Mix ½ teaspoon salt and ¼ teaspoon baking soda in 8 ounces of warm water. Lean over sink; press one nostril close with a finger and squirt the salt mixture into the other nostril with a bulb syringe. Allow it to drain; gently blow your nose. Repeat 2-3 times, then treat the opposite nostril. Honey and Lime Juice; mix about a tablespoon of honey with a couple teaspoons of lime juice. Take spoonfuls of the mixture and try to send it straight down your throat instead of taking it directly into your mouth first, before swallowing. This will soothe irritated throats and suppress mild coughing temporarily. Hot Chicken Soup; cook chicken soup loaded with pepper, pungent spices and garlic. This promotes the thinning of mucus along the mouth, throat and lung cavities. The hot chicken soup is said to improve the function of cilia in the nasal passages that protect the body from harmful viruses. Bed Rest; the most natural thing you can do while infected with the influenza virus, is rest. Your immune system will benefit from the rest and this will promote healing–it is in the deep stages of restful sleep that the body undergoes metabolic and tissue restoration.